This is our flagship Cape Town safari package, offering an authentic Big 5 safari experience in a well established wildlife reserve. Animals that once roamed the area freely living amongst the San Bushmen for millenia but were eradicated over time, have now been reintroduced into this magnificent wildlife reserve. The Big 5 – Lion, Leopard (rarely spotted in the Western Cape), Buffalo, Elephant and Rhinoceros as well as various other species such as Gemsbok, Springbok, Hartebeest, Eland, Kudu, Black Wildebeest and Zebra will be seen on Sanbona Wildlife Reserve. Natural small game such as Jackal, Caracal, Aardwolf, Ant bear, Brown Hyena, Grey Rhebuck, Steenbuck, Klipspringer, Grysbok and Common Duiker continue to thrive. Sanbona, a 54000 hectare wildlife reserve offers guests three luxurious lodges surrounded by towering mountains and open plains, allowing clients to relive the legacy of the San people and absorb the beauty of the Little Karoo. Supporting around 650 species of plants flowering at different times throughout the year, although some more prolific between August and September. There are various floral kingdoms that make up the Reserve, including Acacia Thickets, Nama, Karoo, Renosterveld, Succulent Karoo and Central Mountain Fynbos. Succulents are especially varied and fascinating with names like Baby’s Bottoms, Ostrich Toes and Pig’s Ears. Impressive rock formations, San Bushman paintings, over 160 bird species and other high profile animal species including free roaming White Lion enable this special safari experience to stay with you long after you have departed this stunning reserve. Game drives will take 3 – 3.5 hours depending on how much time is spent at each sighting. It is advisable to bring warm clothes along for the drive even in the hot summer months. Your game ranger will provide ponchos and warm blankets and has a bird book and binoculars. Remember to bring your camera and video camera with you. All safari options in the Western Cape are in relatively newly established private game reserves and thus it is not fair to compare to a safari in a more established game viewing area like Kruger National Park which has been around for a hundred or so years. 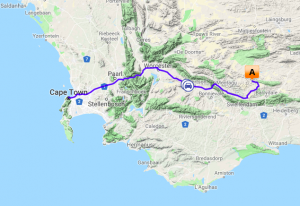 Take advantage of being on the worlds longest wine route (Route 62) by booking private road transfers which will allow for some leisurely touring, taking alternative routes over scenic mountain passes and offering optional wine tastings (own account) in a choice of either Wellington, Franschhoek, Paarl & Stellenbosch wine regions. Beautifully appointed tents exude an atmosphere of pioneering adventure in a vast and hidden landscape, surrounded by awe-inspiring rock formations which was once the home of ancient Khoisan hunters. Situated on a horseshoe bend of a dry Karoo ravine, the lodge with 9 luxury tents has a Relaxation Retreat, communal lounge with fireplace and TV, wine cellar and open air boma. Consists of 3 separate units including 6 large open plan suites, each opening onto private verandas overlooking breathtaking views of undulating mountains and plains. This lush oasis setting of Tilney Manor is surrounded by carefully laid out indigenous gardens. Overlooking Bellair Dam and resembling a typical thatched Karoo homestead, offering 12 generously proportioned luxury suites, each with endless views over the plains, Anysberg-mountains and beyond. Children of all ages will be entertained with an exciting “Kids on Safari” program. This unique walking experience is ideal for guests looking for an adventurous and authentic option offering an ambiance of a tented bush camp. The camp is located in a superbly shaded river line, north east of the reserve and approximately 30 minutes drive from Dwyka Tented Lodge. This is a flexible experience for guests to experience and explore the Sanbona Karoo as we believe that the rigidity of travel needs to be simplified by going back to basics. This explorer camp reflects the original safari of being on foot and sleeping around the fire at night within the comfort of a mobile tent. Guests will enjoy walks through the magnificent Sanbona Wildlife Reserve, whereby their guide will enhance their experience with birding, cultural history and other natural history of the area. Children are accommodated at Gondwana Family Lodge only. Adult rates apply to persons (12 years and older) sharing one room or suite. Persons 12 years and older are considered adults and will therefore require their own room/suite at the applicable rates. Children 4-11 years only at Gondwana Family Lodge, no additional cost for children 0-3 years. Included: All breakfasts, lunches, dinners, tea, coffee, water game drives, guided walks, game drive beverages, welcome lounge transfers at set times, tourism levy and 14% Vat (all other beverages are excluded and can be settled upon departure). Excluded: This safari is a self-drive package and excludes any transport. 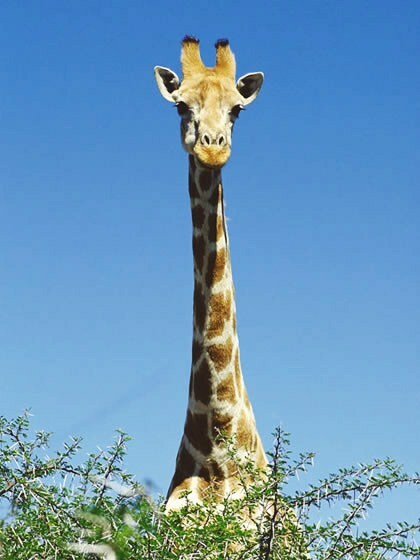 I found African Blue Tours on the internet while searching for safaris out of Cape Town. David Smith recommended Sanbona Wildlife Reserve, which we enjoy very much. He took us there in person and arranged to have us picked up and take on a short tour of the area south of Table Mountain. I cannot recommend him too highly for personal service and advice. What is the pick-up time and location? What is included with this safari? Lunch, dinner and breakfast, game drives, accommodation and standard transfer (Not included in the self-drive tour). You will be staying in your own private lodge. During the game drives, you will be sharing the vehicle with other guests. Private transfers can be arranged via us, which also allow you to do some sightseeing on the way, taking alternative routes or even do a wine tasting. Western Cape is a malaria-free province. You won’t need any malaria medication. There are various types of accommodation, including private lodges and a camp. You will probably not see the leopard, as they live wild in the surrounding mountains and only pass through the reserves from time to time, usually at night. It can be organised on any date although subject to availability. Breakfast, lunch, diner, coffee and tea is included. 2 game drives a day are included. In what language is this tour available?